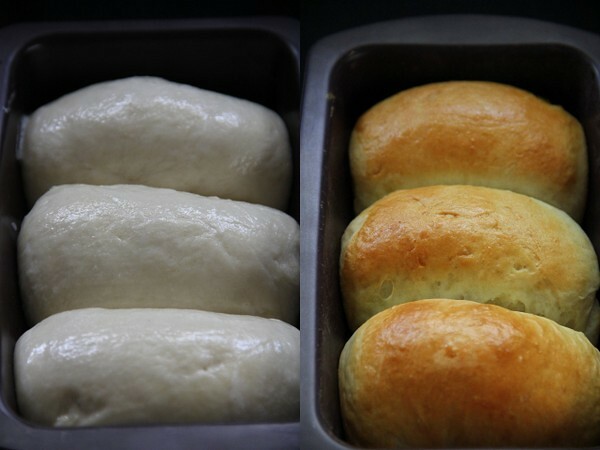 Makes one loaf (9” by 5” tin), 2 small loaves (6” by 4” tins) or 1 small loaf (6” by 4”) and 6 small rolls (muffin tins). 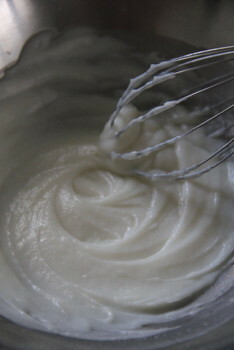 Whisk together lightly the flour and water in a saucepan until smooth and there are no lumps. Place the saucepan on the stove, and over medium heat, let the roux cook till it starts thickening. 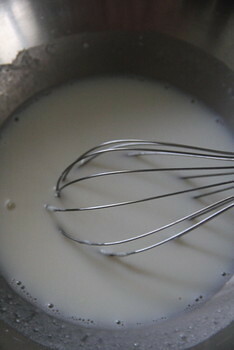 Keep stirring/whisking constantly so no lumps form and the roux is smooth. If you have a thermometer, cook the roux/tangzhong till it reaches 65C (150F) and take it off the heat. If like me, you don’t have a thermometer, then watch the roux/ tangzhong until you start seeing “lines” forming in the roux/tangzhong as you whisk/ stir it. Take the pan off the heat at this point. 1. Feel the heat of the mix with your index finger; will be the maximum bearable heat. (Bearing in mind, the warm 36 deg C- our body heat and steaming hot 100 deg C of boiling water, 65C is somewhere in the middle). 2. 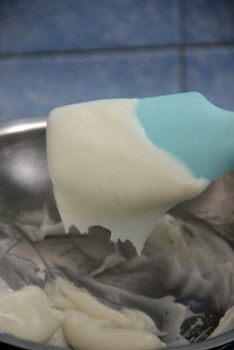 Tangzhong falls slowly as a thin sheet from a rubber/silcon headed spatula after done. It will have the consistency of a soft and creamy crème patisserie. Let the roux/tangzhong cool completely and rest for about 2 to 3 hours at least. If not using immediately, transfer the roux to a bowl and cover using plastic wrap. 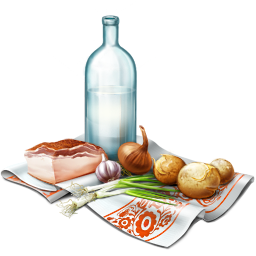 It can be stored in the fridge for about a day. Discard the tangzhong after that. I made the mix, the previous night and chilled overnight in a tupperware container. The next morning I brought it back to room temperature along with the other frozen ingredients, butter and cream. This way, I could start making the bread right away in the morning. --> Make the dough in a food processor. This dough can be made by hand but the dough is a bit sticky and can take some time and effort to knead by hand. If you have some sort of machine which will do the kneading for you, use it. And do not add more flour to make it less sticky either! Add butter and process till you have a smooth and elastic dough which is just short of sticky. 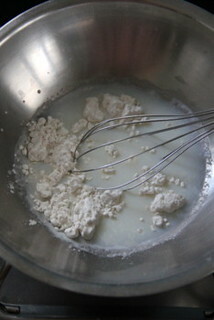 --> If the dough feels firm and not soft to touch, add a couple of tsps of milk till it becomes soft and elastic. --> When the dough is done, you should be able to stretch the dough without it breaking right away.When it does break, the break should be form a circle. 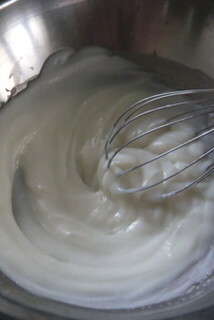 --> Form the dough into a ball and place it in a well-oiled bowl turning it so it is well coated. Cover with a towel or cling wrap and let the dough rise for about 45 minutes or till almost double in volume. Place the dough on your working surface. You don’t need flour to work or shape this dough. This recipe makes enough dough to make one loaf (9” by 5” tin), 2 small loaves (6” by 4” tins) or 1 small loaf (6” by 4”) and 6 small rolls (muffin tins). Depending on what you are making, divide your dough. If you are making 1 loaf, divide your dough in 3 equal pieces. If you are making two smaller loaves, divide your dough into 6 equal pieces. 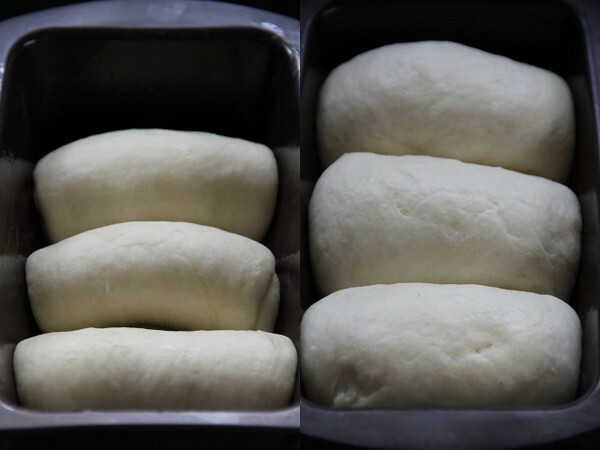 For one small loaf and 6 small rolls, first divide the dough into two equal pieces first. Then I divided the first half into three equal pieces to make the loaf. The other half was divided into six equal pieces for six rolls. I made a small loaf with original recipe halved, as below..
3. Roll out each portion of the dough with a rolling pin into an oval shape, about 1/8” thick. Take one end of the dough from the shorter side of the oval and fold it to the middle of the oval. 4. Take the other end, from below, and fold so it slightly overlaps the other fold. 5. Turn over. 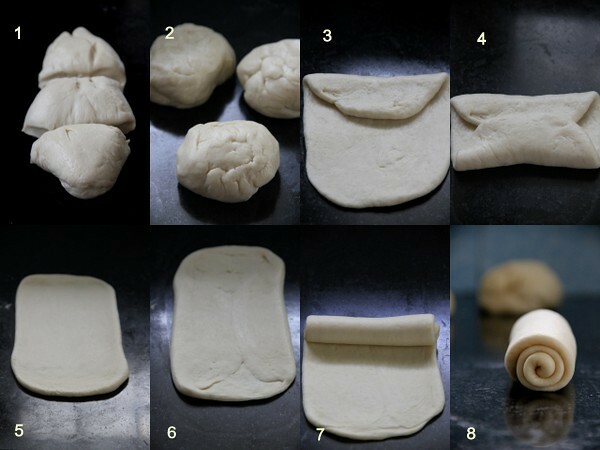 Roll this folded dough, lengthwise, with the rolling pin so the unfolded edges are stretched out to form a rectangle. 6. Turn over again so that the folded edges are visible. 7. Roll the rectangle from one short edge to the other, pinching the edges to seal well. 8. Place the edges facing down. 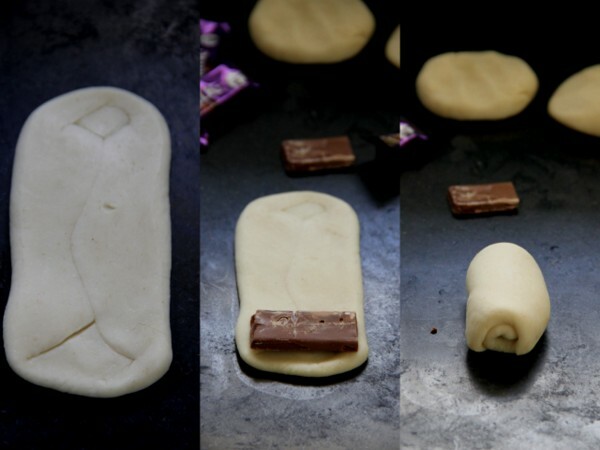 Do this with each of the three larger pieces and place them, sealed edges down, in a well-oiled loaf tin. Cover with a towel or cling wrap and leave the dough to rise for about 45 minutes. 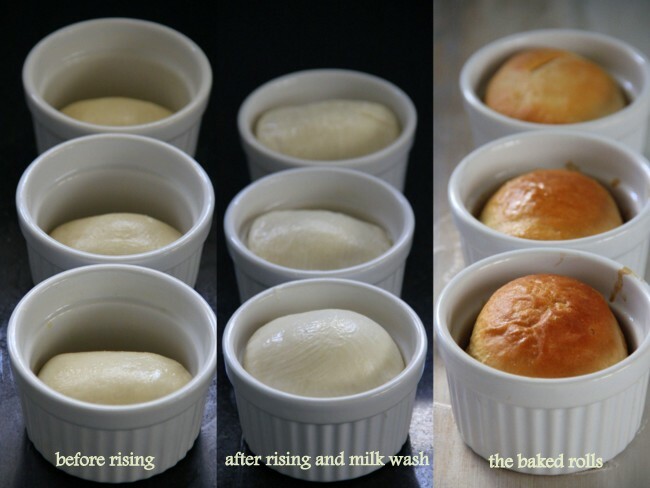 Milk wash done on the risen rolls Baked! Carefully brush the tops of the rolls and the loaf with milk or cream (I used a mix of a tsp each of milk and cream) and bake them at 170C (325F) for about 20 to 30 minutes till they are done.If you tap them they’ll sound hollow and beautifully browned on top. Let them cool in the tins for about 5 minutes and then unmould and transfer to a rack till slightly warm or cool. No first and second rising were given for these animals as I took a total time of around 15-20 minutes for shaping. The animals were soft to eat! As you can see, this is a very versatile dough. 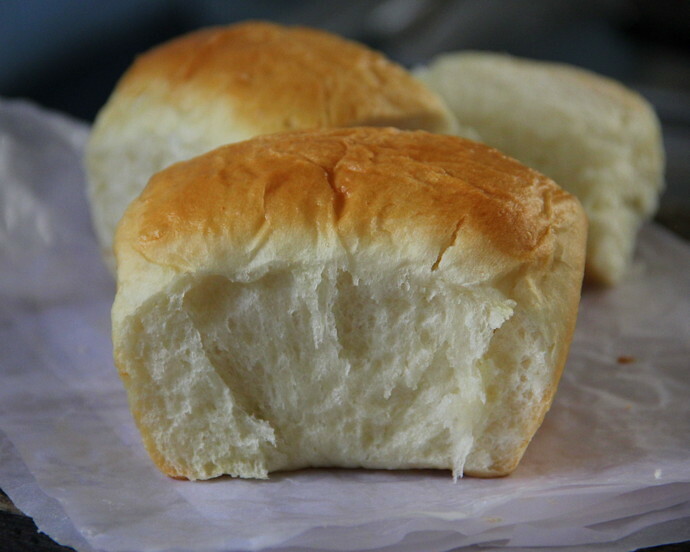 You can make into a plain loaf, or dinner rolls. 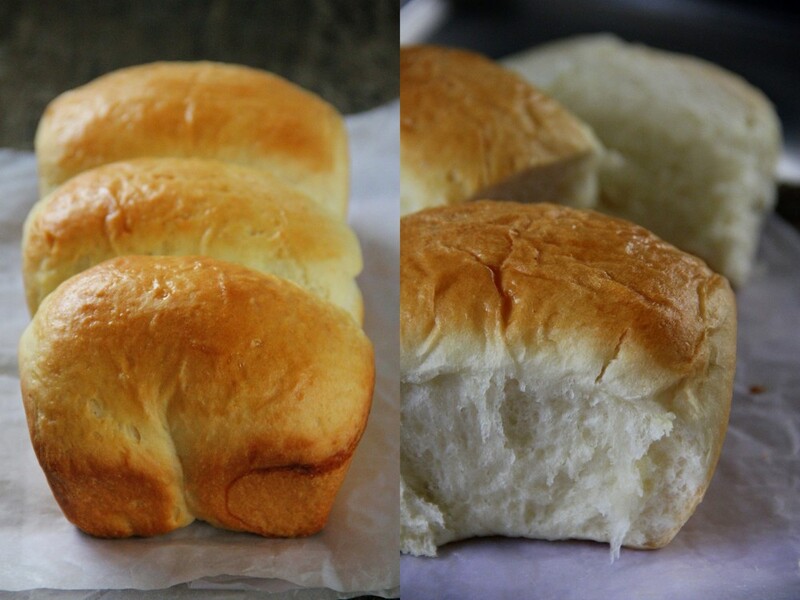 You can fill the rolls with sweet or savoury fillings. 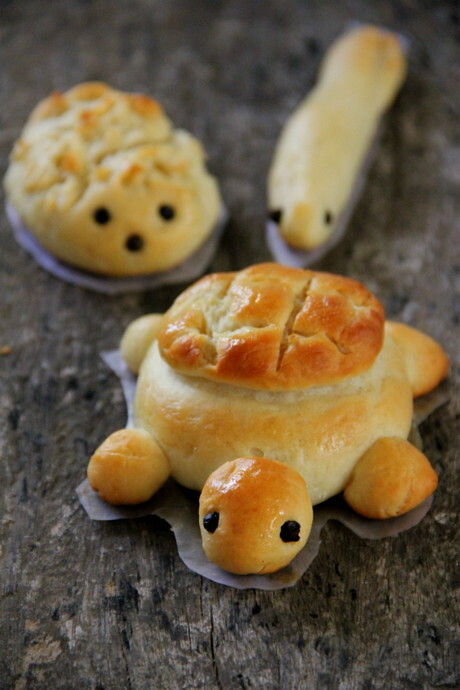 You can even shape the dough into knots, or cute little animals. This dough also makes the softest Pav/ Pao for Pav Bhaji. The recipe below asks for a small amount of cream as an ingredient. If you would rather not use it, just omit it and add 2 tbsp of milk instead. If you would like to make this vegan or milk and milk product free, then replace the milk with water and the butter with oil. Of course, then this loaf will no longer have the typically “milky” taste of a milk bread but will still be a pretty good bread. The bread is easy to make though the recipe seems to be elaborate. I ended up baking it 4 times within a week and enjoyed each time while doing it! 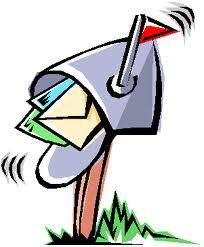 Very nicely done, appreciate your patience in making and explaining. oh wow... such a beautiful post... the bread looks lovely and those chocolate rolls, yum!!!! i simply loved the picture showing the dough and the other baked....what a beautiful golden brown baked bread - lovely writing. like jeyashri said - appreciate your patience in explaining this recipe so clear. 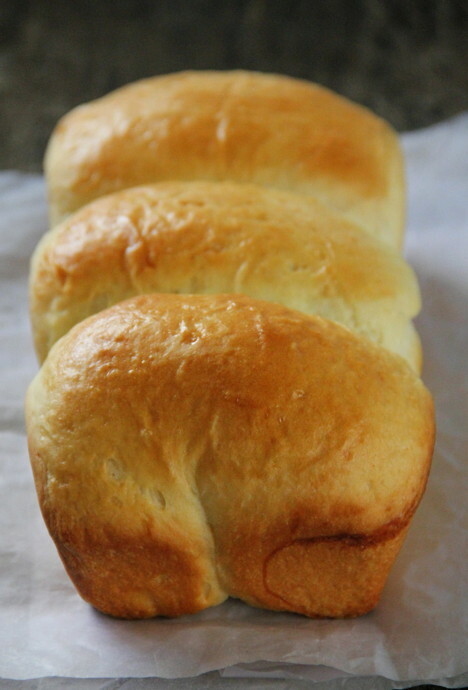 The texture of this milk bread is unbelievable, while the browning on top is of professional quality. 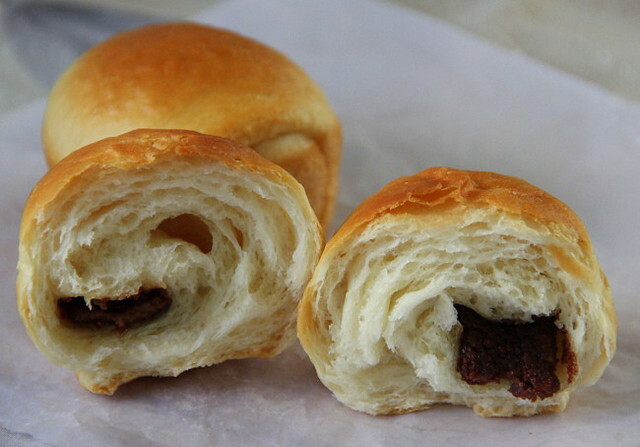 Your chocolate rolls are the best! Can I have one of those? The cute animal shapes are very pretty too. Believe me, you are a great baker, Bharathy! love the idea of making individual servings by putting them in ramekins!! thanks for the idea!!! looks so soft and so delicious!!! So soft and delicious looking bread. Simply drool worthy. Wow.. awesome clicks.. Fluffy, soft white bread...And love those cute lil animals.. Beautifully baked bread, mindblowing and well done.Super cute animals. 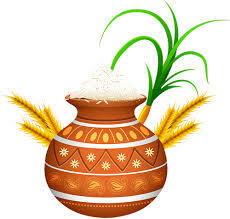 I have to bake this bread Bharathy. I am so hooked to it seeing it all over facebook. And love those cutie pies, nah bread. I will keep those cute animals in mind when I bake it for my little one. Gosh they looks so perfect and that little turtle one is just adorable! The hokkaido milk bread looks great! I've never had it. I think I'm going to try making it soon! Also,Thanks for participating in this month's DMBLGiT contest!